help the members to do the browser automation. a.	Xcode installed on Mac OS X.
d.	Launch the SafariLauncher.app on connected device from Xcode. g.	Install ios-webkit-debug-proxy … use below command from terminal. 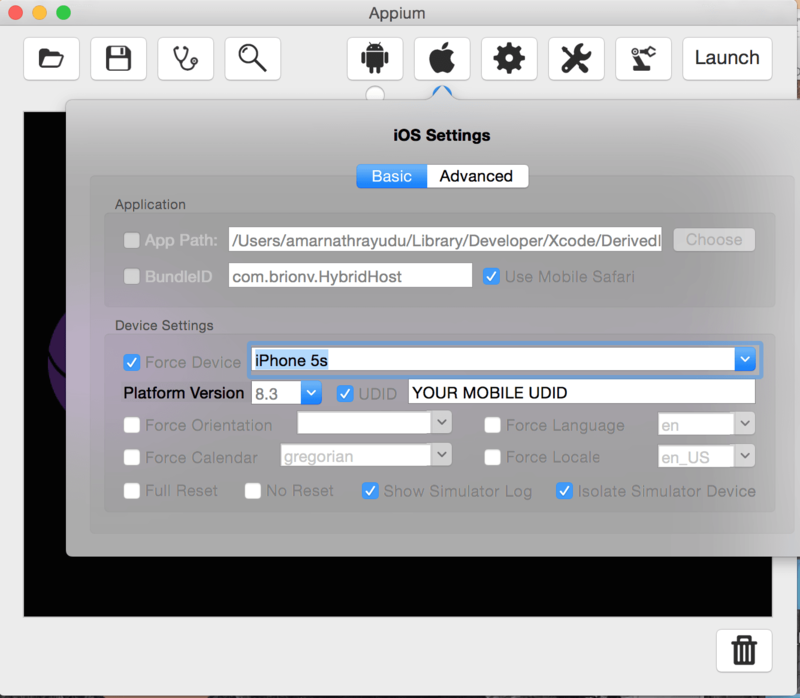 Open appium IDE, add your device details as mentioned in the below screen. You are all set to run your test now. Below is the standalone TestNG/java file to open google home page. Please let me know if you face any issues, Happy coding. Unable to launch safari browser even in Simulator: error: Could not prepare mobile safari: Error: Couldn't find built in app in its home or temp dir! Really appreciate your initiative. This will definitely help our community and mobile world. 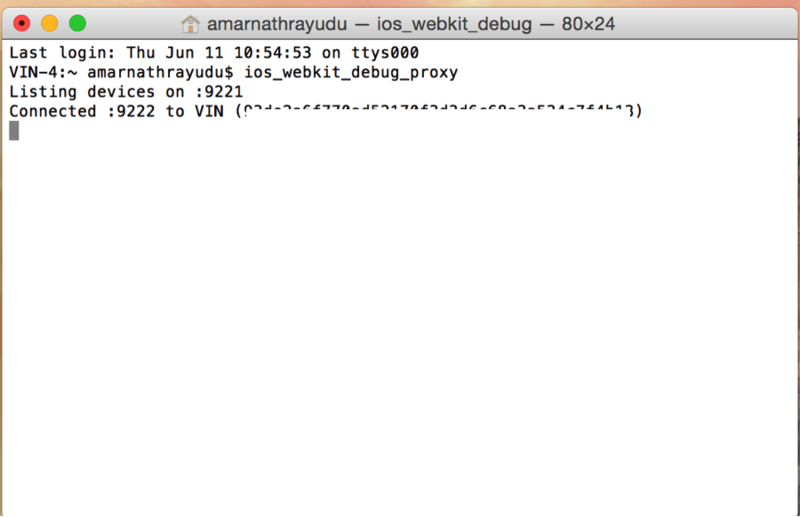 @AmarnathRayudu Are you able to continuously run SafariBrowser in iOS real device. Like some 100+ testscripts continuosly without any break/stall??? We are also doing automation on real device on iOS on safari, but test execution is not stable. We face issues with stale tabs which remain in the browser in case a script fails. Now we are facing an issue when we try to click an element which opens a new tab. As soon as new tab is opened we see an issue in appium server- The target application appears to have died. Do you have any idea about this issue ? Can any one of you please let me know how to open the safari from Xcode ? I have gone through the above the Pre-requisites and I have done the same set up but I got stuck @ one step. These things I have already done - SafariLauncher is installed via XCODE on IPAD Mini Air (9.3) and device is also connected using os-webkit-debug-proxy. Can anyone guide me here ?? Hey @Mukesh_otwani, can you please tell me how to do that ? how to get the xcode project and launch it from xcode ? Download XCode and Install it. After installation import the SafariLauncher in xcode and Run it. Friends, I did all my setup. 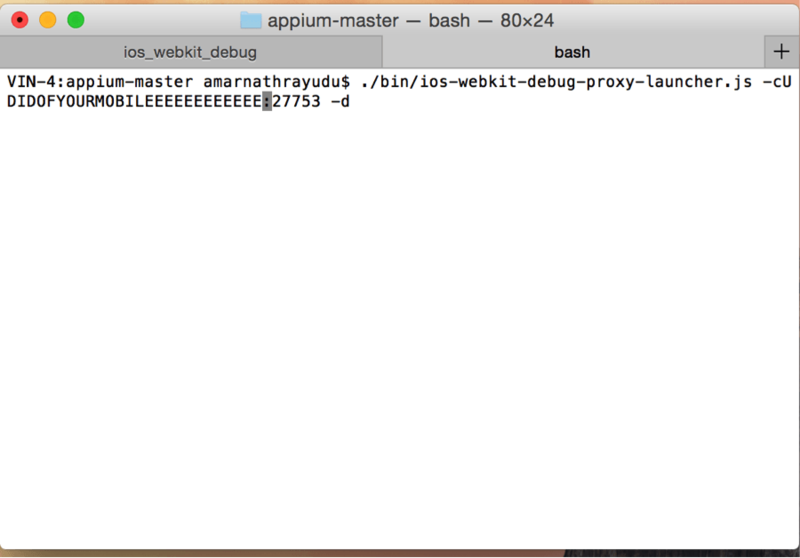 That is setting up Safari Launcher and webkit proxy as well. The problem is when I start the test Safari Launcher starts and opens up the browser but no URL launches. Just the apple.com page launches. The same test runs well on Simulator. Hey @yukonpd, you should launch the url from your test scripts, not the SafariLauncher. Just to remind the same lines work on the Simulator, I have appium 3.1.0 version under my POM.xml. Just let me know if you need more info. Please change the url driver.get("
When we click on Forgot Your PIN button. The application will redirect to a Safari Web page where I have the below fields. Mobile Number, Last Name and Data of Birth Picker. I am unable to tap or select Mobile Number field by using Tap feature of Safari browser using Appium Inspector. So please someone help me how to tap or select Mobile number field of a browser. Did you solve it? Could you share for us your solution? No till now I did not get any solution, if anything is there i will let you know guys. Hi, I am facing issue with safari on real device. SafariLauncher opens the safari browser on device but did not hit my URL. I am facing the same issue. could you pls share the solution? I got the same error which you were getting earlier, could you please confirm whether you got a solution for this.